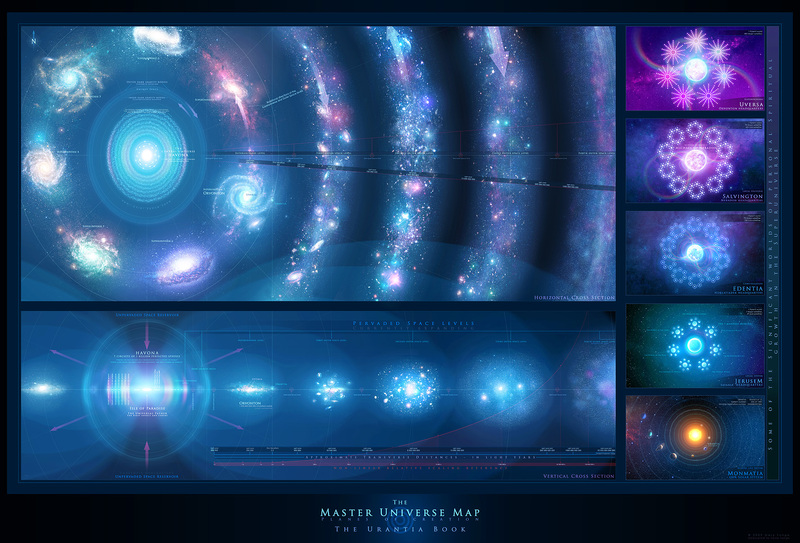 the pic below is from urantia,7 universes and 1 central universe ，just as wm depicted our grand universe. the symble of urantia is down,middle 3 circles ,just like chamber 18,and centric circles are so much in wm paintings. Question 23 -- There are several references within The Urantia Book that seem to be corroborated by the WingMakers' material. An example is the planetary reference number of earth. Also, the cosmological structure as depicted in The Urantia Book seems similar in some respects to the WingMakers. How does The Urantia Book factor into the WingMakers materials? The Urantia Book is a Tributary Zone. It is not associated with one of the seven Tributary Zones because these are encoded sensory data streams, and The Urantia Book is pure text without encoding. Nonetheless, it's part of the collection of Tributary Zones for stage two as talked about in question 17. The Urantia Book is most closely aligned with Lyricus' cosmological sciences discipline, but it was not written or composed by Lyricus. It derives mostly from interdimensional sources -- the equivalent of an earth-based teaching organization, only from a different planetary system. Sometimes planetary systems will exchange important writings or revelatory works for the purpose of circulating philosophical ideas or important revelations. This work is such an example.